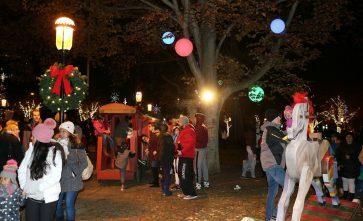 The Christmas Festival at the Morristown Green will once again bring the magic and the wonder of the season to the town’s famous Green. 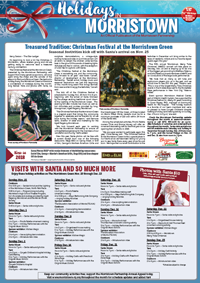 Decked out in holiday finery, the Morristown Green will become a wonderland of nostalgia during the month-long festival. 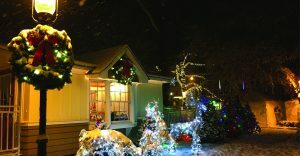 Visits and photos with Santa, holiday crafts, ice sculpture demonstrations, a vintage-style rocking horse and rides on a miniature train will all return to delight the children while families bask in the glow of thousands of dazzling lights. 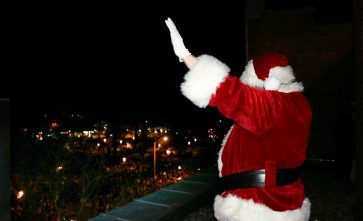 The event kicks off on Sunday, November 25th with Santa’s arrival atop Century 21 Department Store and the 100+ year traditional Lighting of the Morristown Green from 5 to 5:30 p.m. 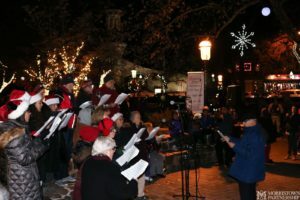 The evening will continue with Santa visits and photos from 5:45 to 8 p.m., as well as seasonal entertainment and hot chocolate and cookies courtesy of event sponsor, Hyatt Regency Morristown. 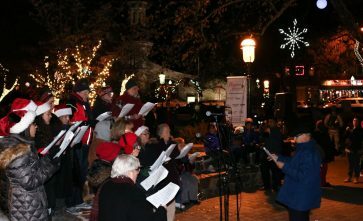 As we send out letters for our Annual Appeal, many donations come back with heartfelt stories of the memories made during the holiday season in Morristown. Sends us your stories! 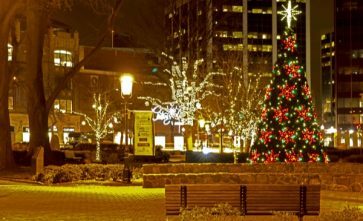 Use the hashtag #HolidaysinMorristown to post your treasured memories or new experiences to social media. With your permission, Morristown Partnership would love to post your memories on our website. Post on social media, send us an email, mail a handwritten note or draw us a picture of your favorite memory and we’ll share it here. 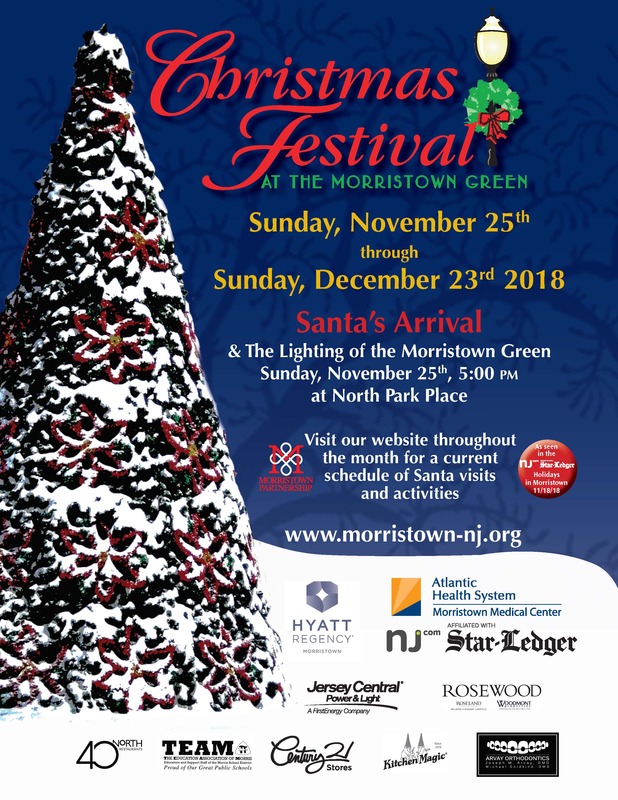 Help us welcome Santa to Morristown with help from the Town of Morristown Fire Department, Morristown Police and Morristown Partnership and Town of Morristown officials. Santa photos FREE with a current receipt from any of the following: Mega BBQ, End of Elm, George & Martha’s American Grille or Grasshopper Off the Green. 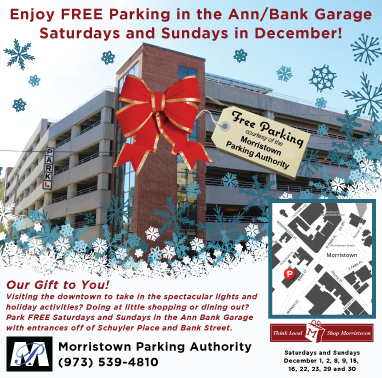 FREE Parking, courtesy of the Morristown Parking Authority, is available in the Ann-Bank Garage on Saturdays and Sundays in December. 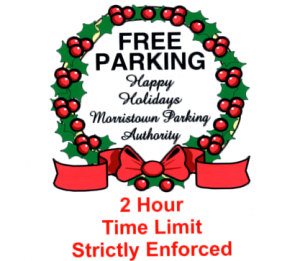 Enjoy FREE 2-HOUR on-street parking courtesy of the Morristown Parking Authority through 12/24 Designated on-street meters only. 2-Hour time limit strictly enforced. 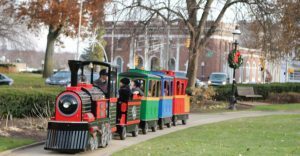 Inclement weather may delay or cancel activities on the Morristown Green during the Christmas Festival. Check this page and our social media for updates on delays and cancellations due to weather. Emergencies, Lost & Found, Lost Persons? All emergencies should be immediately reported to the Morristown Police; Morristown Partnership staff will be onsite to assist with contacting the appropriate emergency personnel . Lost & Found? Lost person? Information? 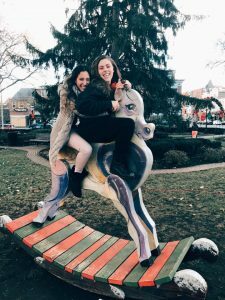 Come to the Santa House located in the center of the Morristown Green; Morristown Partnership staff will be happy to help you! The Office Tavern Grill in Morristown first opened its doors in June of 2014. A reinvention of what was an iconic New Jersey restaurant chain, The Office Tavern Grill prides itself on providing its guests with a crafted experience. The menu is a modern American cuisine take on classic comforts, paired with 40 rotating taps and hand crafted cocktails. Our Monthly “Road Trip” around the United States provides our guests with regionally sourced ingredients, state specific classics, and small batch crafted beers. Since opening its doors in 2007, George + Martha’s American Grille in Morristown has been offering a modern American menu in a sophisticated and fun atmosphere. The restaurant features an exciting nightlife, from Happy Hours to live entertainment and hosted events. Whether you’re looking for lunch, dinner or cocktails with friends, George + Martha’s is a great choice every day of the week. Our dining room can be used for parties as well as for sit-down dinners. No matter the occasion George + Martha’s will create a unique experience for you and your guests! Arvay Orthodontics is the largest Invisalign practice in Morristown. “We enjoy producing great smiles” says Dr. Joseph Arvay, a twelve time New Jersey Monthly Top Dentist. We are proud to be the only orthodontist in Morristown to be recognized with this achievement. Our proven techniques are enhanced by more than two decades of clinical experience treating difficult cases with the right treatment plans.” The doctors believe in early interception and utilize a number of approaches that children and adults find comfortable and fast. .Their orthodontic regimens consistently achieve beautiful smiles that last a lifetime. Century 21 Department Store opened its doors in Downtown Manhattan in 1961. It is now a NYC retail icon, known for designer brands and amazing prices. What started as a 6,000 sq. ft., 3-story store is now a 220,000 sq. ft. and 7 floors of fashion, expanding with new locations across the country. Due to the success in New York, Century 21 crossed the bridge and set up its first New Jersey shop in historic Morristown. Discover the convenience of New York City at the Hyatt Regency Morristown. Our contemporary hotel is located just steps away from The Morristown Green, a historic park located in the heart of downtown Morristown. Our upscale urban retreat is within a 5-10 minute walk to over 60 popular options of entertainment, shopping, and restaurants. Pamper yourself to a stay in one our 256 oversized guestrooms and enjoy the sweeping views of Morris County. When you’re ready to explore the area, hop on the New Jersey Transit for quick 50 minute train ride into New York City or take advantage of many interesting attractions, like George Washington’s Headquarters and Museum and Mayo Performing Arts Center. Jersey Central Power & Light (JCP&L) serves 1.1 million customers in the counties of Burlington, Essex, Hunterdon, Mercer, Middlesex, Monmouth, Morris, Ocean, Passaic, Somerset, Sussex, Union and Warren. JCP&L’s 1,500 employees are dedicated to delivering safe, affordable and reliable service. They are also engaged in supporting the communities the company serves. In the past decade, JCP&L employees have donated approximately $518,000 to United Way; contributed nearly 140,000 pounds of food and raised approximately $118,000 for harvest for Hunger; and given of their time and talent volunteering at non-profit organizations. Follow JCP&L on Twitter @JCP_L, on Facebook at www.facebook.com/JCPandL or online at www.jcp-l.com. Dreaming of a brand new kitchen? Let the dedicated team at Kitchen Magic help you make that dream a reality. We bring the showroom to you so you can see all the colors & styles in the comfort and lighting of your own home. We’ll give design advice and listen to what you envision for the heart of your home! We’ll measure and leave you with a free estimate of costs, complete with any promotions and discounts available. Still family owned and operated since 1979, we have remodeled 50,000 kitchens for homeowners just like you. Choose cabinet refacing, new cabinets, countertops, backsplash and floors to completely transform your kitchen. Our worry-free Lifetime of Home-ownership Warranty comes with every kitchen. Call today (800) 237-0799 or visit kitchenmagic.com for more information. Woodmont Properties, based in Fairfield, NJ is one of the region’s leading developers of residential and commercial real estate. We’re led by a dynamic group of highly-skilled executives and an extraordinary staff of professional team members, all of whom are fully committed to the thorough and effective completion and management of our development and building projects. Our highly-skilled team possesses an unparalleled combination of experience and expertise. Each team member is personally committed to delivering world-class multifamily, single-family, industrial, office, retail, hospitality and transit-oriented mixed-use properties in suburban communities and town centers. Our wide-ranging success is derived from a unique blend of innovation, integrity, superior locations, and high-quality design. The Star-Ledger is the largest circulated newspaper in New Jersey and is based in Newark. It is a sister paper to The Jersey Journal, The Times of Trenton, South Jersey Times, Express-Times and the Staten Island Advance, all of which are owned by Advance Publications. The daily circulation is 157,584 and the Sunday circulation is 235,394. The Newark Daily Advertiser, founded in 1832, was Newark’s first daily newspaper. It subsequently evolved into the Newark Star-Eagle. S. I. Newhouse bought the Newark Ledger in 1935, and merged the paper with the Star-Eagle in 1939 to become the Newark Star-Ledger. Here at TEAM: The Education Association of Morris are committed to a single goal; we strive to make the world a better place for our community’s children. Explore our website (www.morristownteam.org) to learn all we do to achieve this. TEAM, like our parent organization, the New Jersey Education Association, is a diverse, democratic organization working to create an optimal environment to achieve excellence in public education in New Jersey. The mission of TEAM is to advance and protect the rights, benefits, and interests of members, and promote a quality system of public education for all Morris School District students.